I don't know if this is photoshopped or what (I suspect not), but I don't really care. I just like what these pictures represent. That is one ambitious cat. I believe I cribbed this from the Something Awful forums. I don't know why, but I have a hankering for some Hawkgirl/Catman match up. so...when the cat catches the bird...then what? Are cats worthy of a F%&( Yeah! moment? I'd think so (not that I know anything about "F%$@ Yeah!" moments), dweeze, but not based on this photo. Because, if this is indeed an undoctored photo, the cat depicted is clearly an idiot. 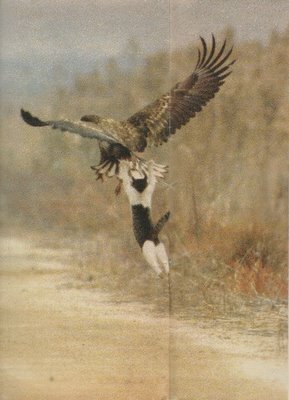 If you are a smart domestic cat, you do not go attacking raptors that are twice your size. 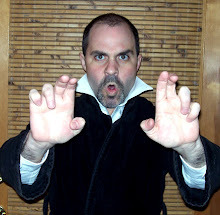 As I recall, those photos ran in Fortean Times sometime ago. I don't remember any other details other than it was in Japan, and yes it's real. Jesus, that cat is Hard. Core. We used to have this innocent-looking little barn cat that would take down (and eat) rabbits twice her size. She was hard-core. I believe there's a lesson here for us all. vericode: quzhosol. Ask your doctor if it's right for you. In that cat's defense, that is clearly a bird and because it is so large there must be a lot of tasty meat in it. Where on the SA forums did you find this gem? That cat is totally Airwolf. Actually its not a hawk, its a golden eagle. Probably better the cat didnt latch on, he would have been dinner later, but I give an awesome A+ for effort! haha. Loved it! Makes a good motivational poster. I'm with canton; one of my cats has little regard for the size of its prey! That crow up front in the first shot is breathing a sigh of relief. Maybe him and the cat are part of a hustle. 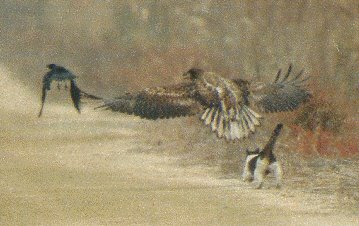 The crow's a decoy so the cat can sneak up and rob Eddie the Eagle's dinner money or summat. Senator Calls For "Sentinel Bra"
Beware the Juggernaut, my homey! Blogger, why you hate me so much?